This lighthearted gavotte is part of French Suite No. 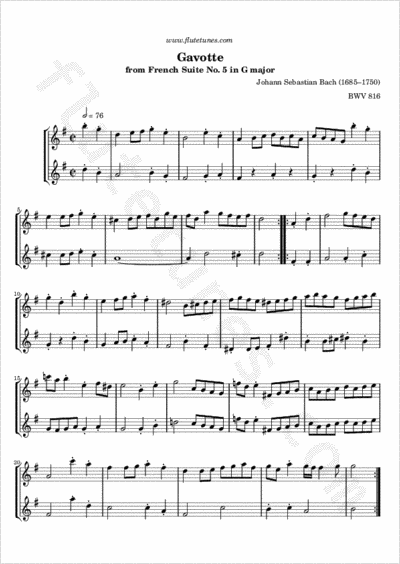 5 in G major for harpsichord, composed by Johann Sebastian Bach in 1722–1723. Each of the six French Suites contains the four dance movements that Bach made standard for the genre: Allemande, Courante, Sarabande, and Gigue. In Suite No. 5 Bach inserts three movements between the Sarabande and Gigue. The first of these is the famous Gavotte, a sprightly, French ballroom dance in 2/2 meter with a modulation to the dominant key of D major at the end of the first half.